For so many of the school projects I work on, the conundrum is how to care for it once it’s installed/built/planted. Here’s a solution to that question that brings me joy. I’ve been the volunteer chair of the Grounds Committee at my son’s high school for the past 3-½ years. He’ll be graduating in the spring and I will finish up my term with, if I don’t say so myself, a great system in place for caring for the campus landscape. It turns out that teenagers can do just about everything. The key was figuring out how to harness their abundant energy for the good of the grounds. 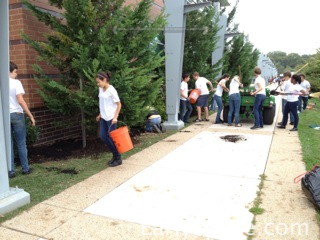 The Grounds Committee has developed a program called “Greening the Grounds” where classes, teams and clubs to adopt-a-spot on the grounds to care for. It started when one brave teacher volunteered his class the first spring, then a few more the second year (with just a little arm twisting on the part of our staff liaison) and finally, now, groups are contacting us to request a spot and we have ownership of almost the entire grounds. One key to our success is the signs. 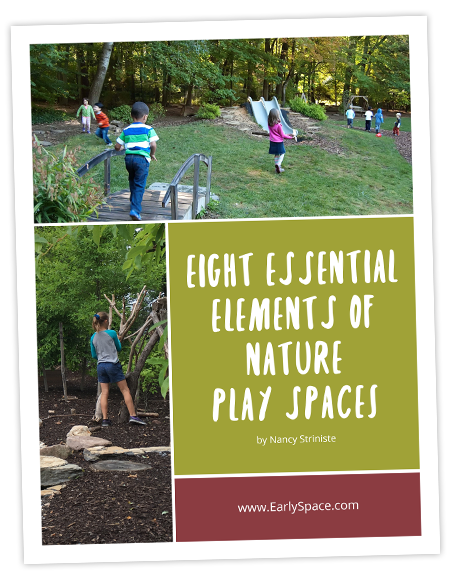 They are a great source of pride for the kids, AND keep them accountable to keep the spaces kept up. 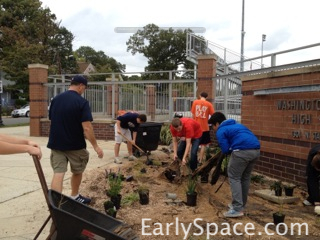 The baseball team planted a pollinator garden in school colors, by the big sign. The Future Business Leaders weed the bed by the flagpole. 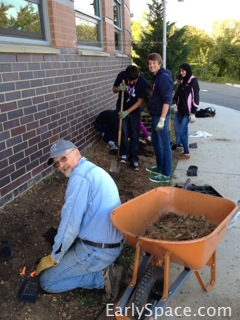 The Minority Achievement Club and the Community Service Club each have a an area to weed and mulch. 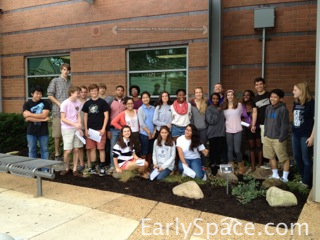 The intrepid IB Environmental club has worked on different areas for the past 3 years. The first year they created a dry stream, planted it with native plants and this year won a county beautification award for the project. The second year they installed, BY HAND, 500 square feet of pervious pavers to cover a muddy lawn eroded by foot traffic. 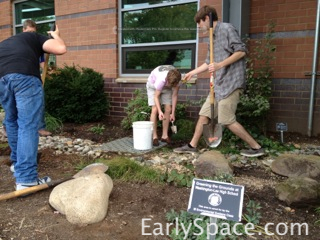 And this year they planted a student designed native garden at one of the other campus entries. The Lumberjack Club… yes, there is a Lumberjack Club. I asked my son, when they contacted the committee to volunteer, what the Lumberjack Club does. He said, “I don’t know. I think they wear flannel shirts and eat pancakes.” Turns out they wanted to plant trees too, but until they found out about our Greening the Grounds Project, didn’t know how to go about it. 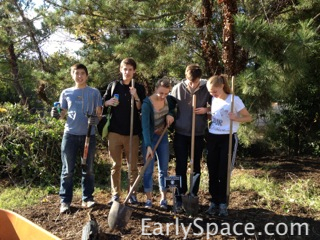 On the appointed day, a gang of about 10 kids arrived, ready to cut down invasive burning bush that had been planted when the school was built, and replace it with a hedge of native plants. 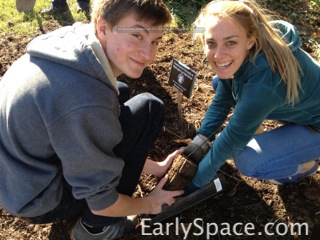 We discovered that most of the kids in the club had never planted anything before! It was thrilling for them, and for us, to teach them the steps and watch them dig in. Getting kids outside, hands in the dirt, being active, learning how to care for the environment, taking responsibility for their school, feeling pride in their very visible accomplishments. What could be better? !